Page 2 - Finshed Puppy Book1. and even a small amount of Asprin can be fatal to your cat. use the Heimlick maneuver but use with caution, excessive force may cause internal injuries. Call our clinic if choking continues. by other signs of illness call the clinic. elevated. #3 DO NOT try to reset the fracture. or blanket to wrap your pet in. 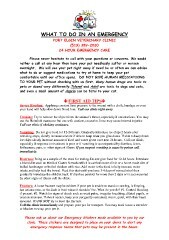 emergency response teams that pets may be present in the house.